Products using microprocessors generally fall into two main categories. The first category belongs to high-performance microprocessors such as the Pentium in applications where system performance is critical. In the second category, performance is secondary and the microprocessor for this category is often called a microcontroller. A microcontroller is nothing but a compute with most of the necessary support chips onboard. The 8051 is a widely used microcontroller which takes input from the device it is controlling and controls the device by sending signals to different components in the device. It is like a unit that acts like a processor which solves real world problems. Arduino is an open-source development board or a set of boards with its own dedicated IDE (Integrated Development Environment). It’s a computing platform for building electronics projects. 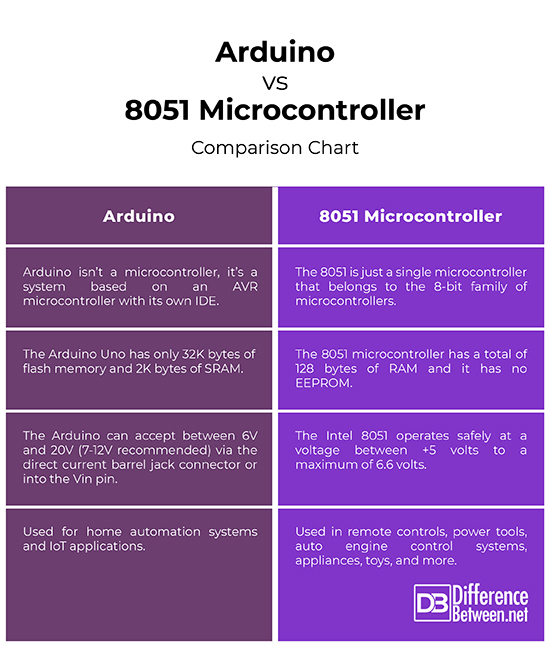 We highlight some key differences between Arduino and 8051 microcontroller to see which one stands out. Arduino is a microcontroller board that comes with pre-tested software and hardware libraries and has its own integrated development environment (IDE). It is a computing platform used for building electronic projects. In fact, one of the beauties of designing projects around Arduino is that it takes care of even the low-level electronic detail for you. There are three main components of the Arduino ecosystem: the Arduino board, external hardware, and the Arduino IDE. All these components work in tandem to enable you to do just about anything with Arduino. You can program the device to do anything like control lights and motors or read sensors. Just like a microcontroller, it processes inputs and sends out outputs. At the heart of every Arduino is an Atmel microcontroller unit. 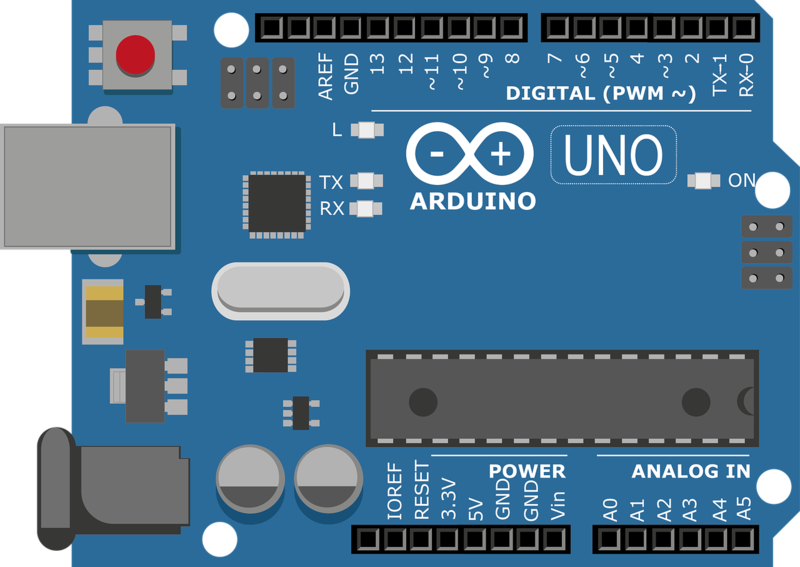 Arduino boards, including the Arduino Uno, use an AVR ATMega microcontroller. The 8051 microcontroller is the 8-bit family microcontrollers and is one of the most popular microcontrollers in widespread use. Intel Corporation introduced the 8051 microcontroller in 1980 and since then, 8051-family chips have been used as the base of thousands of products. There are other companies, including Philips, Fujitsu, Siemens, Dallas Semiconductor, OKI, and Matra Harris that make 8051-family chips. Some companies have expanded the 8051 family by offering compatible chips with additional features. An enhanced version of the 8051, the 8052, also exists with its own family of variations. The 8051 model is a collection of 8-bit and 16-bit registers and 8-bit memory locations, which together can be made to operate using the software instructions that are incorporated as part of the design. The 8051 has 128 bytes of RAM, 4 kilobytes of ROM, 2 Timers, 1 serial port, and 40 pins DIP. The 8051 is just a single microcontroller that belongs to the 8-bit family of microcontrollers. The prime use of a microcontroller is to control the operation of a machine using a fixed program that is stored in ROM and that does not change over the lifetime of the system. Arduino, on the other hand, is a microcontroller board that comes with pre-tested software and hardware libraries and has its own integrated development environment (IDE). Arduino is a like a single component of a computer programmed to accomplish repetitive tasks and is used to develop electronics projects. The 8-bit Intel 8051 operates at a voltage between +5 volts to a maximum of 6.6 volts. This means 5.0 volts is the safe operating voltage but it can operate at a maximum operating voltage with 6.0 volts if you manage to provide a diode in between. A constant regulated power supply should be applied for successful working of the 8051 microcontroller. The Arduino can accept between 6V and 20V (7-12V recommended) via the direct current barrel jack connector or into the Vin pin. It has built-in 5V and 3.3V regulators; the 5V is used for all the logic on the board and the 3.3V accommodates 3.3V shields and external circuitry. The 8051 microcontroller has a total of 128 bytes of RAM which are assigned addresses 00 to 7FH. These 128 bytes are divided into three groups: A total of 32 bytes (00 to 1F Hex) are set aside for register banks and the stack; a total of 16 bytes (20H to 2FH) are for bit-addressable read/write memory; and a total of 80 bytes (30H to 7FH) are used for read/write storage. It can have external memory up to 64K bytes. The Arduino Uno has only 32K bytes of flash memory and 2K bytes of SRAM. It also uses another form of memory, the EEPROM to store long-term information but is slower than SRAM. The 8051 was initially developed for use in embedded systems but later expanded to industrial control applications. They are frequently used in automatically controlled products, such as automobile engine control systems, remote controls, appliances, power tools, office machinery, and toys. Arduino can read sensor data and control components such as lights, motors, thermostats, and garage doors. Arduino projects are frequently used for building the IoT (Internet of Thinks) applications. It is also used for home automation systems and a wide range of innovative applications from robotics and lighting to gardening and games. In a nutshell, Arduino itself isn’t a microcontroller but a microcontroller board with its own IDE and which comes with pre-tested software and hardware libraries. The Intel 8051 microcontroller actually refers to the whole family of 8-bit microcontrollers with numbers ranging from 8031 to 8751. An enhanced version of the 8051, the 8052, also exists with its own family of variations. Arduino is a relatively new system based on the AVR architecture with more RAM and ROM than the 8051, making it ideal for embedded applications and projects. Sagar Khillar. "Difference Between Arduino and 8051 Microcontroller." DifferenceBetween.net. January 29, 2019 < http://www.differencebetween.net/technology/difference-between-arduino-and-8051-microcontroller/ >.